A science team from across the Gulf region sailed from Cocodrie, Louisiana, USA, on the R/V Acadiana to the Hercules site after the blowout that took place 23 July 2013. (From SPILL International) — The vessel was loaded with ocean drifters to track movement of surface waters around the rig and with equipment to collect time-sensitive samples of water, air and sediment. Working with federal authorities, the research team received sampling access to within 500 metres of the rig. The first expedition left port on Saturday 27 July 2013 6 AM in bad weather and rough seas and sailed to the incident site. That afternoon and evening, despite challenging conditions, drifters were transmitting GPS signals of their movement and researchers began collecting water and sediment samples. The crew returned to port around midnight for rest and supplies. On Sunday evening the vessel left port again and science crews continued their work through Tuesday, successfully gathering data. CARTHE were able to suggest locations where researchers on R/V Acadiana should deploy drifters. 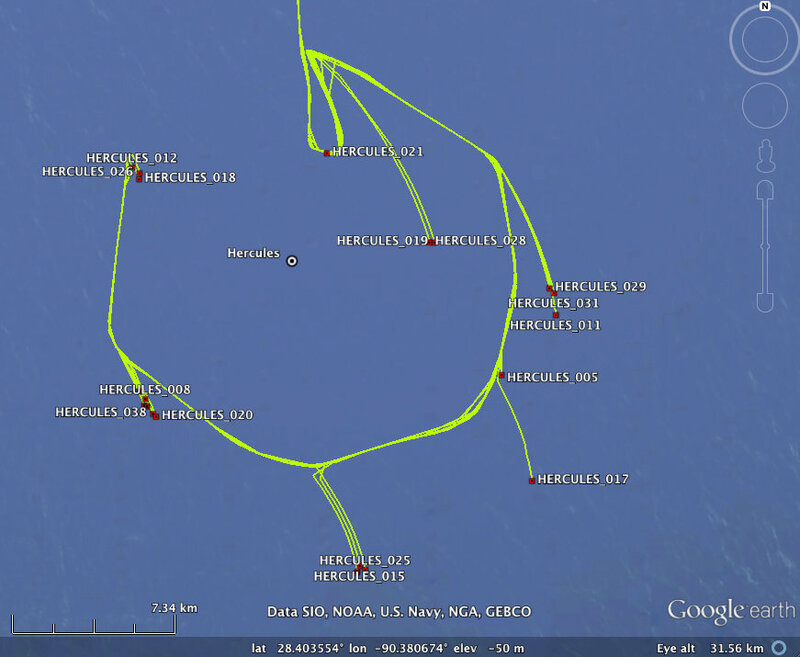 Sites are in a circular pattern around the Hercules Rig with radii changing from 1km to 10km. This gas-well blowout represents an opportunity to document impacts of contaminants in a shallow water environment. The foresight, resourcefulness, and collaborative efforts of these quick-acting researchers should give the public, responders, and other scientists key information about the incident arena, at essentially its beginning, to better understand impacts as this event evolves.